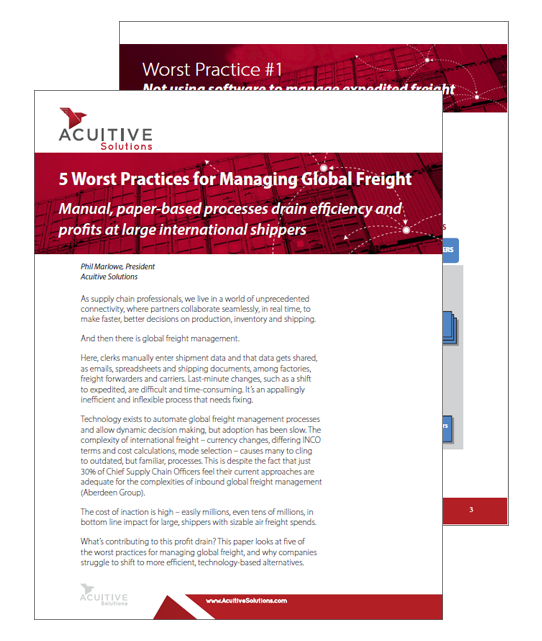 Acuitive’s founders and leaders are experienced logisticians with a real-world understanding of the complexities of global freight management. Our solutions reflect the practical experience of industry veterans who want to apply modern technology to the fractured and highly manual processes still pervasive in the industry. Phillip “Phil” Marlowe is President and Founder of Acuitive Solutions, LLC based in Charlotte, North Carolina. Prior to co-founding and self-funding Acuitive in 2002, Phil held sales, management, and application development positions with several leading transportation, 3PL, and supply chain software companies including Sea-Land Service, Buyers Consolidators, BridgePoint, FedEx Supply Chain Services, and GTNexus. In total he has more than 25 years experience in global logistics. As Acuitive’s lead executive officer, Phil is responsible for corporate strategy, operating performance, business and product development, sales, administration and end-to-end customer satisfaction. A native of Northeast Ohio, Phil holds a B.S. in International Finance and Economics from The Ohio State University Max M. Fisher School of Business. He is a longtime avid participant in the Council of Supply Chain Management Professionals (CSCMP) having served several terms as President of the Charlotte CSCMP Roundtable, and is a former Regional CSCMP Roundtable Advisor, former Global Roundtable Programs Chair, as well as a former member of the CSCMP Strategic Advisory Committee. When not busy solving customer supply chain challenges you can find Phil hanging out with his family, golfing, or following college sports. William H. “Bill” Robbins, Jr. is Vice President, Development and co-founder at Acuitive Solutions. As Acuitive’s chief technology officer, Bill created the company’s IT infrastructure and proprietary operating systems. He is responsible for all TMS system software development, process design, analysis and reporting tools, operating network performance, and quality assurance. Bill directs Acuitive’s developers and testers and is responsible for new technology development and end-to-end applications that solve customer problems. In his off hours you can find him biking, honing his Tai Chi and Yoga skills, following boxing, football and baseball, reading sci-fi and supporting the good works of homeless and hunger initiatives. Look out for his sense of humor… it’s along the lines of Monty Python. A native of Piscataway, NJ, Bill attended the University of Maryland. Jim is a 25-year veteran of the transportation and information technology industry. For Acuitive, he is responsible for strategic planning, platform operations, system architecture and deployment, product development and customer service. Prior to joining Acuitive, Watkins co-founded and was chief technology officer for NeoModal.com, a start-up technology portal providing ocean TMS software. When NeoModal was acquired by Descartes Systems, Inc., Watkins joined Descartes as vice president of the transportation management group. Earlier, he served as CIO for Sea-land Service, Inc., an ocean transportation, trucking and intermodal services provider. He joined Sea-Land from Pepsi-Cola International, where he was director of information technology. Jim is a graduate of New York State University, where he earned his Bachelor of Science degree in Finance. Karl Mumbower is Director, IT/Development at Acuitive Solutions. Karl has worked in the computer industry since 1982, combining skills in software and Website design with experience in formulating solutions specifically around logistics challenges. His prior positions include VP of Engineering at Intelis, a telephony software vendor. He also worked in a variety of development and managerial roles at Lithonia Lighting, a commercial lighting company, and GroupGel, a developer of social media tools. Before that, he served for eight years in the healthcare industry as a consultant and software designer. A native of Marietta, GA, Karl attended the Kennesaw State University.